For Boys and Girls age 7 -13. 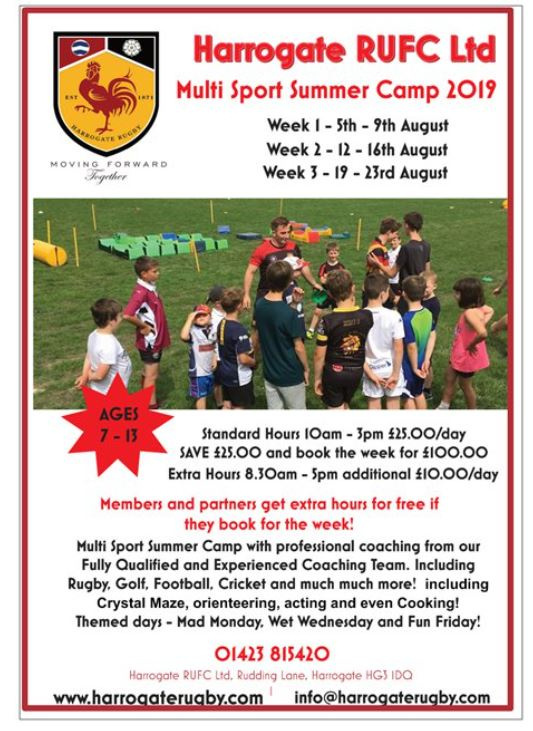 Our multi sport summer camp includes Rugby, Golf, Football, Cricket, Athletics and much much more!! We have fully qualified professional coaches that include David Doherty (DOR at Harrogate Rugby), Golf Professional from Rudding Park Golf Academy and Kevin Shattock from Podium Performance, Strength & Conditioning. All our coaches are DBS checked, all qualified and children are always with ration 1:8 max. Different events during the day and extra hour sessions to challenge the participants ability to problem solve, work as a team and think outside the box. Crystal maze, orienteering, acting and even cooking. The Aim of the Camp is to provide a safe and supportive environment for children to play, explore and grow. This is guided by skilled coaches looking to promote the core values of Harrogate Rugby Club. Loyalty, Family, Investment, Pride and Growth. Booking forms are available, please see below. Please call Club Office for more information 01423 815420. Payment must be made at time of booking in order to secure the limited places available on this popular Summer activity.